Isn’t it about time we looked JAK2 straight in the eye?…Or, how about a closer look at Jack (JH1) and Sue (JH2). Think about it. We talk about it all the time? JAK positive. Allele burden. Inhibition. When you really get down to it, what do we know about the JAK2 kinase — mutated or natural? What are our docs thinking when they prescribe stuff to block its action? Pull up a chair and a cup of coffee and let’s talk. It’s time we all got better acquainted with JAK. After all, it looks like we’re going to be living together for a long time. Right now that graphic up there — thank you Stevan Hubbard, NYU/Skirball for producing it — is just ribbons and squiggles with numbers. But hang in a bit and the JAK2 Siamese twin will emerge in 3-D. Yup, that was my first surprise, too. Who knew JAK2 was a twin attached at the belly button. 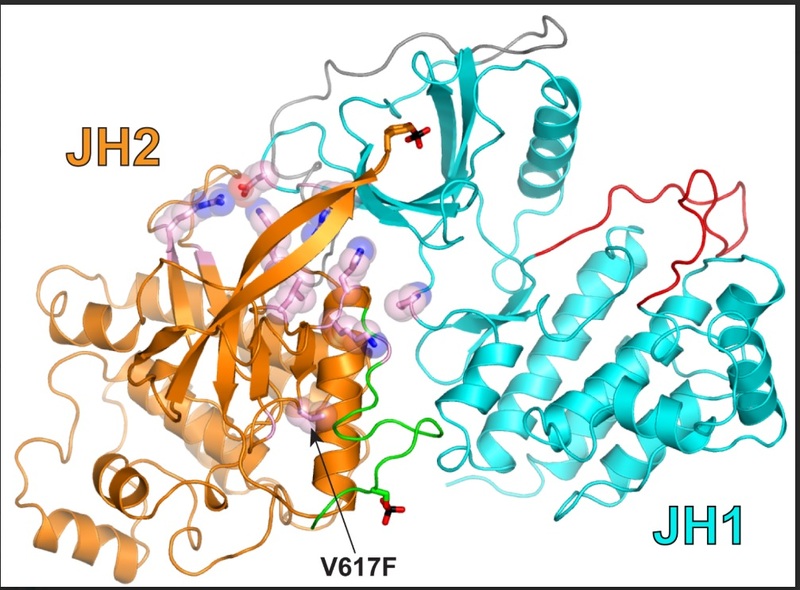 Meet JAK2: The active kinase, the catalyst, on the right, is Jack, JH1 and the pseudokinase on the left, JH2 is Sue. .
Jack and Sue. The JAK family of kinases all have two domains, the kinase or activated enzyme itself — and Sue that twisted up orange thing in the illustration with the pink bubbles on the left, the pseudokinase. Those pink bubbles are mutations, including the infamous V617F mutation. Notice they hang out in a cluster near the link to JH1, the kinase itself. That’s important because the pseudokinase inhibits the JAK2 molecule’s activity, mostly by its physical presence smothering its freedom. (Think of it as Sue not giving Jack enough space.) But all those pink bubble mutations make the link between the two JAK domains unstable, permitting the kinase to wander off and phosphorylate neighbors and collaborators. JAK2 is a gene on the small arm of chromosome number 9. It carries the code for a protein, an enzyme. An enzyme is something that helps make something happen, catalyzes a process. A protein that activates other enzymes or proteins is a kinase. So the JAK2 we measure and deal with is the Janus kinase. Until gene editing or something else comes along, we mostly don’t target the blood-producing stem cell that carries the mutation. We just contend with the end product, the protein or enzyme. JAK2 is one of several Janus kinases and plays a primary role in blood production. It has been around for a long, long evolutionary time. Way before humans or even vertebrates popped up on the planet. Sea squirts and insects have essentially the same JAK system. It’s that ancient and effective. The JAK2 enzyme lives in the cell, in the cytoplasm between the nucleus and the cell surface. Popping up through the cell membrane are receptors — transmembrane cell surface receptors — little receiving stations waiting for signals. These are proteins that communicate messages from the outside world to the cell. What sets the whole blood production line in motion is the arrival of a cytokine (see that red triangle in the cartoon?) like interferon or interleukin. The binding of the cytokine to the receptor turns on the wandering JAK2 which autophosphorylates and then leaps into action. The JAK2 collects phosphorus bound ATP material to phosphorylate another JAK2 for reinforcement. Enter the STAT. Activated JAKs phosphorylate specific tyrosine residues on the “tail” of the receptor, that part of the receptor that is within the cell and create docking sites that attract special proteins, signaling molecules called STATs (Signal Transducers and Activators of Transcription). STATs bind to these receptors and are phosphorylated by JAKs. Once hooked up and charged up, a process called dimerization, STATS drop off the cell receptor and translocate into the nucleus of the cell where all the appropriate genes to produce blood will light up and start generating amino acid chains to be folded up into proteins and escorted out of the cell to where they’re needed. Yes of course it’s all more elegant and complex than that but see how the JAK-STAT system provides rapid communication between organ and tissue requirements into the nucleus and targeted DNA. The system is robust enough to function in fruit flies and zebrafish and trillions of cells in our bodies all the time. See that activation link up there in the drawing? It’s the red line in JHI. When that’s phosphorylated the JAK kinase is active, running all over the place helping, in this case, to convey orders for more blood production. OK, maybe not all over the place. It’s joined by a leash about 100 amino acids long to the pseudokinase… but it is space enough to get active in its neighborhood, specially when there’s action being signaled from the cell surface. 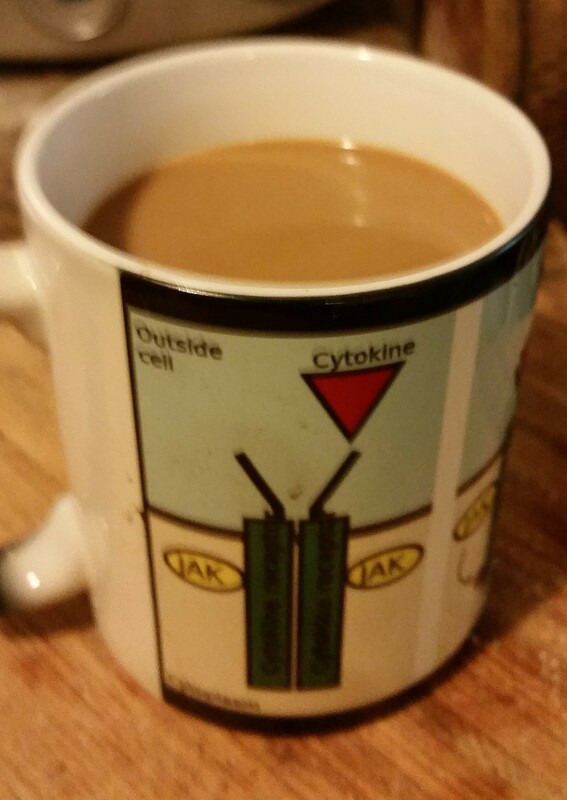 Experimentally, it has been determined that Sue’s presence increases inhibition by decreasing Jack’s affinity for ATP up to ten fold. The v617F mutation however has been shown to greatly increase that affinity by affecting the activation loop. For a fuller discussion, of CHZ868 and Type II JAK2 inhibition head for the Ross Levine interview in this issue and the MPN Quarterly Journal’s The Hidden face of Janus. And don’t forget your coffee.